I have stayed at the apartments before and I love it the first time!!!!! That's why I reserved it again these year. No vuelvo!!! The host was extremely friendly and helpful. T.V. and free Wifi. La vista a mar, crusas la calle y estas en la playa. La ubicación es buena, está cerca del centro comercial. La piscina es agradable y el edificio está en buen estado, los dos apartamentos en los que estuvimos tenían buena vista al mar y se encontraban en buen estado. La preciosa vista al mar desde la Terraza del balcón. Localização; vista e espaço dos apartamentos; boa Internet e ar condicionado. Ubicación y vista desde el balcón. Camas cómodas y buen sistema de aire acondicionado. 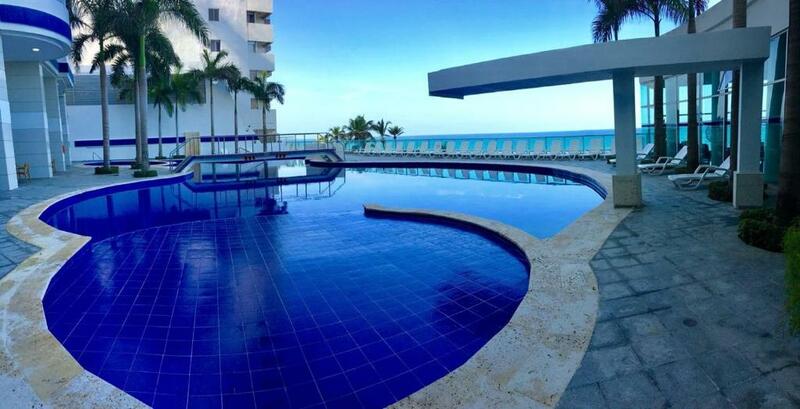 Apartamentos Frente Al Mar Palmetto By CR This rating is a reflection of how the property compares to the industry standard when it comes to price, facilities and services available. It's based on a self-evaluation by the property. Use this rating to help choose your stay! Located 150 feet from Bocagrande beeach and 0.6 mi from the commercial area, Apartamentos Edificio Palmetto offers self-catering accommodations with free Wi-Fi and sea views in Cartagena de Indias. Providing a tranquil environment, the apartments in Edificio Palmetto feature fully equipped kitchens, balconies and 2 bathrooms. Maid service is available for free from Monday to Saturday. The building features a pool, a fitness center, a garden, and a Turkish bath. Guests at Edificio Palmetto can order snacks at the bar by the pool. Apartamentos Edificio Palmetto is 1,650 feet from San Diego square and 1.9 mi from Rafael Nuñez international airport. Free private parking is possible on site. When would you like to stay at Apartamentos Frente Al Mar Palmetto By CR? 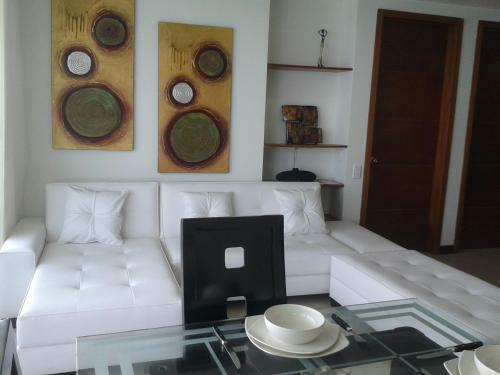 A fully furnished apartment with kitchen facilities, a private balcony and 2 bathrooms. A fully furnished apartment featuring kitchen facilities, a private balcony with sea views, a sofa and air conditioning. The apartment is equipped with 2 bathrooms. A fully furnished apartment located on the upper floors, featuring kitchen facilities, a private balcony with sea views, a sofa and air conditioning. The apartment is equipped with 2 bathrooms. Somos una empresa líder en el sector inmobiliario y de prestación de servicios turísticos en la ciudad de Cartagena. Nos destacamos en el alquiler temporal (días, semanas y meses), con fines vacacionales y/o coorporativos, contando con un equipo de trabajo capacitado para suplir sus necesidades, ofreciendo en todo momento un servicio de calidad, ético y confiable, con más de 30 propiedades de confort en exclusivos sectores de la ciudad. House Rules Apartamentos Frente Al Mar Palmetto By CR takes special requests – add in the next step! Apartamentos Frente Al Mar Palmetto By CR accepts these cards and reserves the right to temporarily hold an amount prior to arrival. Please note that the swimming pool is not available in October 2017. Please inform Apartamentos Frente Al Mar Palmetto By CR of your expected arrival time in advance. You can use the Special Requests box when booking, or contact the property directly using the contact details in your confirmation. I was charged more than confirmed. They gave us a lower floor, i asked for a higher one? Which they did have plenty and they didn’t give it to us, not so clean like I thought it would be.the only good thing was the pool. The only good thing is near everything. Problems with the elevators, long waiting. There are 3 elevators and most of the time only one was working. The check in, the biometrics, the wearing of a wristband. Quality of the bed was poor. Also communication in English with the staff was not possible. The view from the apartment was amazing. Please don't go there! Swimming pool is not working, elevators neither sometimes (had to go down 30floors by the stairs with the luggages), hot water only in one bathroom, A.C. not working, bugs in the bed... many other nice building around, don't loose your time here. This time we had cockroaches in the apartment we reported to the office and they say they will go and put pills to kill them ! We still had some after that we also saw a big cockroach at the lobby !!! At the time of arrival we saw that the pool was under construction !!!!! One of the main reasons why we like this place !!! we call at the apartment a day before we arrive and no one ever mentioned about the pool under construction!!! The host gave us a trip to playa Blanca for the inconvenience of the pool but it was only for a day and we really like best the pool for our kids !!! So this time apartamentos palmetto I would think twice to go back to you! Very bad service. The administration let us wait with two babies for 40 min outside in the heat because they did not feel like coming down to give us the keys. We were given a standard room instead of the deluxe we paid for, we asked for them to correct and the represntative just walked away. When we asked for a reciept we did not get one. Bed sheets too thin. Blanket in the closet had a bad smell and we couldn't use it. Fresh towels were forgotten one day. Although l loved my Stay at your Hotel and I will be probably be coming back and recommend to friends in the US, I would like to recommend management to keep an eye open for roaches, mold in the bathrooms and dust on the electrical apliances- Radio System, TV Stands ect; Your Staff was very friendly and should be commended for that. I like the view,and friendly people.